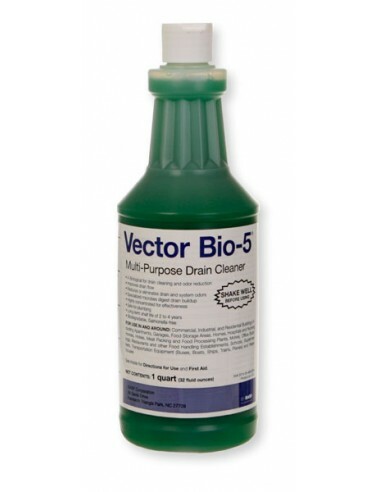 Vector Bio-5 Multi Purpose Drain Cleaner utilizes 5 strains of bacteria working together to break down organic matter commonly found in commercial food facilities. 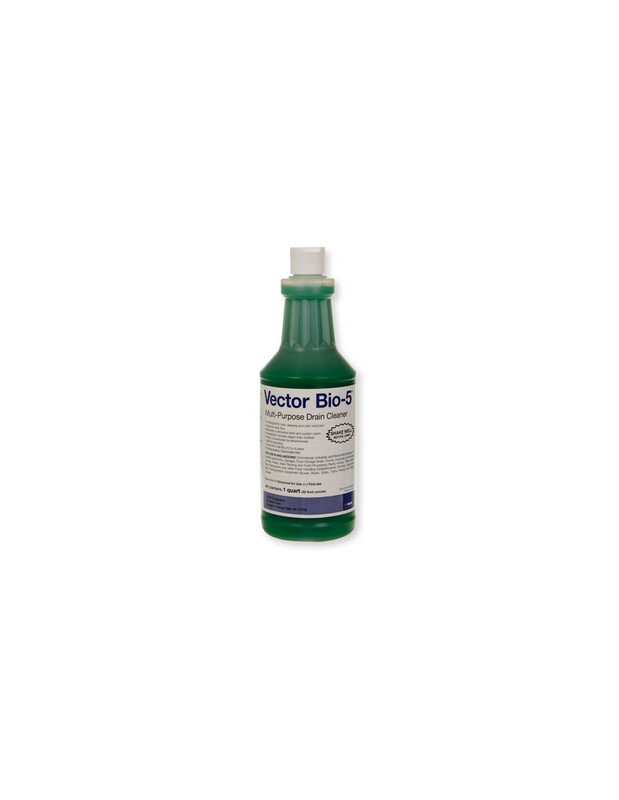 Vector Bio-5 Multi Purpose Drain Cleaner eliminates pest harborages from drains and other difficult to clean areas and neutralizes insect attracting odors from organic matter. It may be used in drains, on floors and other surfaces. * A Biological breakthrough for drain cleaning and odor reduction. * Eliminates drain and system odors. * Specialized microbes provide rapid digestion of organic harborages. * Highly concentrated for effectiveness. * Long term shelf life 2-4 years. FOR USE IN AND AROUND: Commercial, Industrial, and Residential Buildings including Apartments, Garages, Food Storage Areas, Homes, Hospitals and Nursing Homes, Hotels, Meat Packing and Food Processing Plants, Motels, Office Buildings, Restaurants and other Food Handling Establishments, Schools, Supermarkets, Transportation Equipment (Buses, Boats, Ships, Trains, Planes) and Warehouses. DRAIN CLEAN-OUT: Apply 4-8 ounces per drain. Repeat as necessary. For faster results flush with 2-4 gallons of water. MAINTENANCE: Apply 2-4 ounces per drain. Repeat as necessary. Recommended 1-2 applications per month. SURFACE TREATMENT: For use in odor areas such as restrooms, janitorial closets, food preparation floor areas, garbage containers, dumpsters and surrounding areas. Apply 2-4 ounces using a trigger sprayer to odorous areas. For large services dilute 4-8 ounces per gallon of water and apply with a mop, compressed air sprayer or through a power washer. Repeat as necessary. To avoid or prevent slipping, deny entry to wet area until completely dry.